Head of the Guyana Revenue Authority (GRA) Godfrey Statia on Thursday stressed that he is committed to following taxation and legal principles in the matter of a disputed tax assessments against the Guyana Telephone and Telegraph Company Limited (GTT). 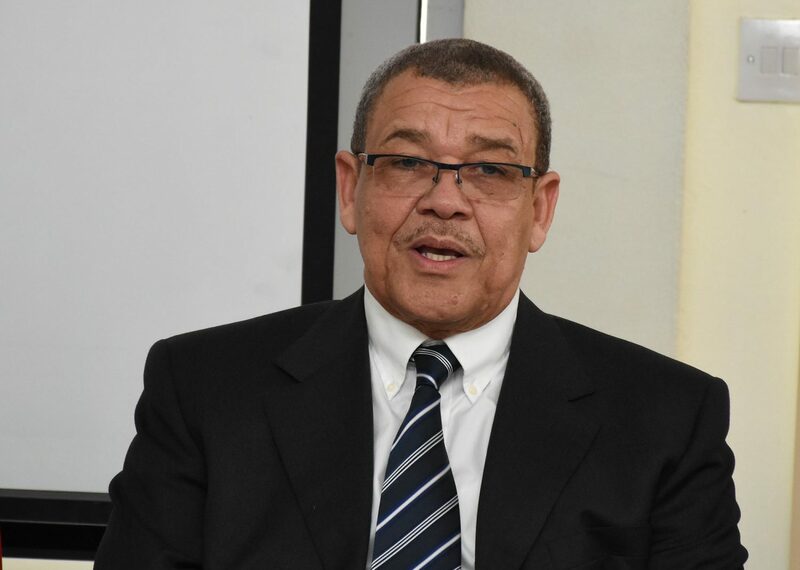 Minister of Public Telecommunications Cathy Hughes recently noted that liberalisation of the telecoms sector has been stalled by tax issues involving the two entities, while GTT’s 2016 annual report has reported that the assessments total US$44.1 million. Statia, however, told reporters at a press conference that GTT’s indebtedness is still being calculated. “As far as I know, GTT has submitted information to me; I am now going through the information. I have asked them for some additional information which they are yet to provide. As long as they provide it, I am willing to finalise those cases,” he said, before adding that time is of the essence in this matter which has been going on since 1991. He later noted that once he arrived at the sum due, he would forward same to government, which would make decisions about whether to pursue the entire sum or forego a percentage. “As long as I reach my figure as to what is due and payable in revenue that goes to the government… they could decide whether they are going to deduct it from any compensation or what is going to happen or these things,” he explained. Statia, a former Deputy General Manager of GTT, stressed that to make taxation political is to create a problem. “It’s based on certain rules and must be consistent with everyone being treated equally,” he said, while noting that if half the assessed sum were collected 26 years ago, those involved would’ve been in a better situation rather than hold on to those objections all along. He further noted that this is a subject matter that is engaging the court and as far as he is aware is set to be heard in March. Statia appeared to be questioning how a negotiation process could be occurring on a matter which remains sub judice. “There is process that needs to be followed for matters before the court and that process is you approach the court and say we are in a negotiating mode. We have to respect the rights of the taxpayer and the court notwithstanding all of these negotiations,” he added. The Commissioner General, who is also an attorney at law, repeatedly reiterated that he could not decide how much in revenue GTT would actually pay. “That is not a decision for me. I am bound by the law, I am bound by tax principles. If the tax principle says we did not raise the assessment in accordance with the law and tax principles, I am prepared to reduce the assessment or amend it,” he said. He noted that GTT had in its 2016 annual report recorded US$44.1 million as its maximum exposure but based on certain court decisions made in the past he expects their exposure to actually be half that sum. In the report, GTT explains that it is involved in several legal claims regarding its tax filings with the GRA dating back to 1991 regarding the deductibility of intercompany advisory fees as well as other tax assessments. The company argues that should it be held liable for any of the disputed tax assessments, totaling US$44.1 million, it believes that the Government of Guyana would then be obligated to reimburse GTT for any amounts necessary to ensure that GTT’s return on investment was no less than 15% per annum for the relevant periods. In December, 2016, the Guyana Government with GTT and its parent company, ATN International (ATNI), began negotiation in preparation for the transition to a liberalised telecommunications sector. These discussions followed the amendment of the telecoms laws. GTT had previously maintained a 20-year monopoly on the international gateway and various services until January 2011.